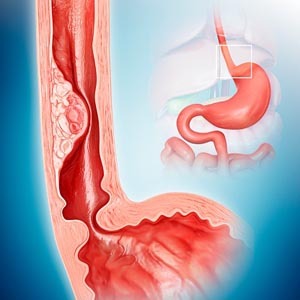 The esophagus is a hollow organ that serves to transport food and liquid from the mouth to the stomach. Esophageal disorders can severely affect quality of life and manifest as heartburn, regurgitation of stomach contents back into the mouth, difficulty swallowing with a sense of food sticking in the chest, or pain on swallowing. These disorders also can cause symptoms beyond the esophagus, including the throat (coughing, hoarse voice, and throat clearing), the nose (sinus congestion/infection), the lungs (asthma, bronchitis, and pneumonia), and the mouth (dental erosions and cavities) and even imitate the symptoms of a heart attack. Our digestive disease physicians are part of the UCLA Robert G. Kardashian Center for Esophageal Health, which uses a multidisciplinary approach to the diagnosis and treatment of esophageal disorders. We work with thoracic and gastrointestinal surgeons, radiologists, neurologists, oncologists, otolaryngologists, pulmonologists, pathologists and nutritionists. This comprehensive, multi-specialty approach is designed to improve quality of life by relieving symptoms, treating the disorder, and preventing recurrences. Visit the center's website to learn about 1) diseases we treat, 2) diagnostic modalities / treatment options, 3) non-surgical and surgical therapies and 4) to view a list of our experts.